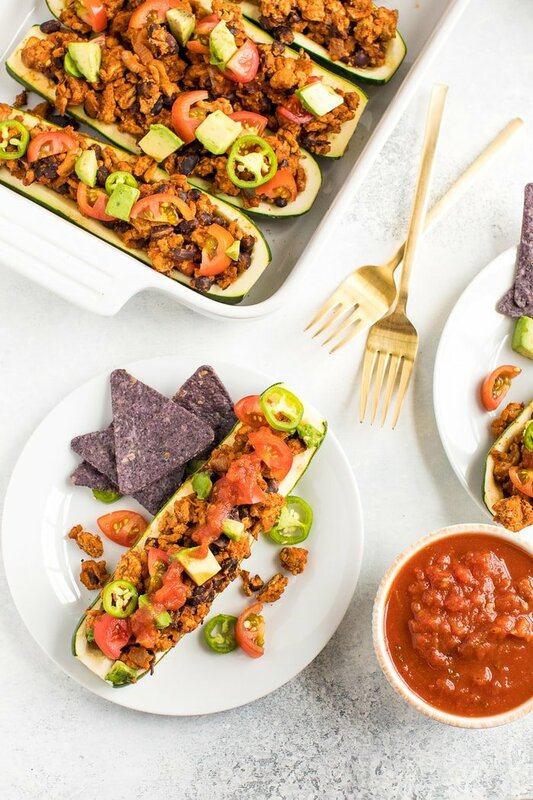 Protein packed and dairy-free, these taco zucchini boats are perfect for a quick and easy healthy weeknight dinner. This post is sponsored by Brandless. I received compensation to write this post but all opinions expressed are my own. I don’t know about you, but I am always on the hunt for quick weeknight dinner ideas. After being in the kitchen developing recipes all day, I don’t really want to be in the kitchen all night. I just want to hang with Isaac and Olive, make an easy meal and relax. 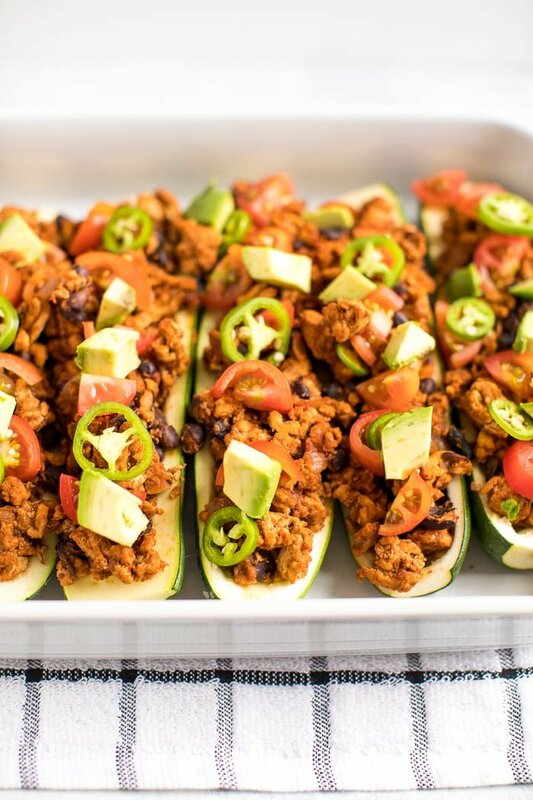 Which brings me to these simple taco zucchini boats. 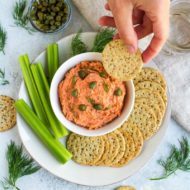 They’re perfect to throw together for a quick, healthy weeknight meal, using products from a new-to-me company, Brandless. If you haven’t heard of Brandless before, let me tell ya about them. Everything in their shop is $3 or less… seriously! They have everything from organic spices to dishes. They cut out the middleman which allows them to keep their prices low and bring products directly to the consumer. They focus on better for you products (all non-gmo, a lot of organic, and gluten-free options) and fair prices which I am 100% about. I also love that you don’t have to be a member! You can purchase as little or as much as you’d like and don’t have to be locked in to anything. PS – Brandless is generously offering Eating Bird Food readers $10 off your purchase of $50 or more. 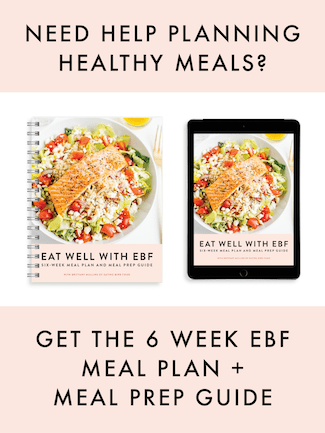 Use code: EBF for $10 off your order! Promo expires 10/3/18. Wooden serving spoons – I cannot get over how gorgeous these serving spoons are (and don’t forget…$3!!). I’m all about gold right now so these fit right into my kitchen collection. 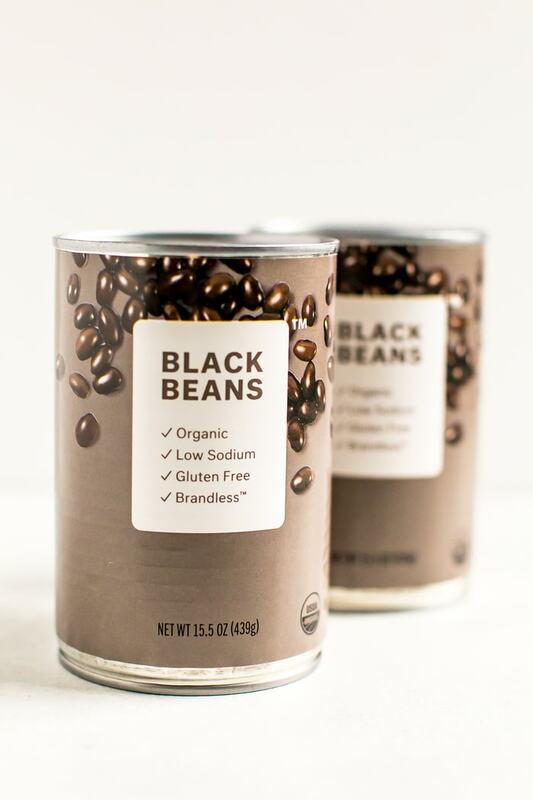 Organic canned beans – We keep organic canned beans, especially black beans and chickpeas, stocked in our pantry so I love that I can get a three pack of organic beans for $3! Organic peanut butter – I don’t know if you know this or not but I’m kind of peanut butter connoisseur and the Brandless crunchy peanut butter is pretty darn good. It’s organic and has just two ingredients – peanuts and salt! No added sugar or oil! I haven’t tried these yet but Brandless also has almond butter and an organic powdered peanut butter. Adding these to my next order. Serving bowl – I feel like a big part of #adulting is having serving dishes. Brandless to the rescue! This gorgeous porcelain serving bowl is…you guessed it: $3. Perfect for serving chips! Non-toxic grapefruit dish soap – Random favorite but it smells SO good! Bonus points for being non-toxic and cruelty free. Spice jars – I just got these in my last order and they’re so cute! I’m trying to have a more organized spice cabinet and these spice jars are definitely expediting that process. 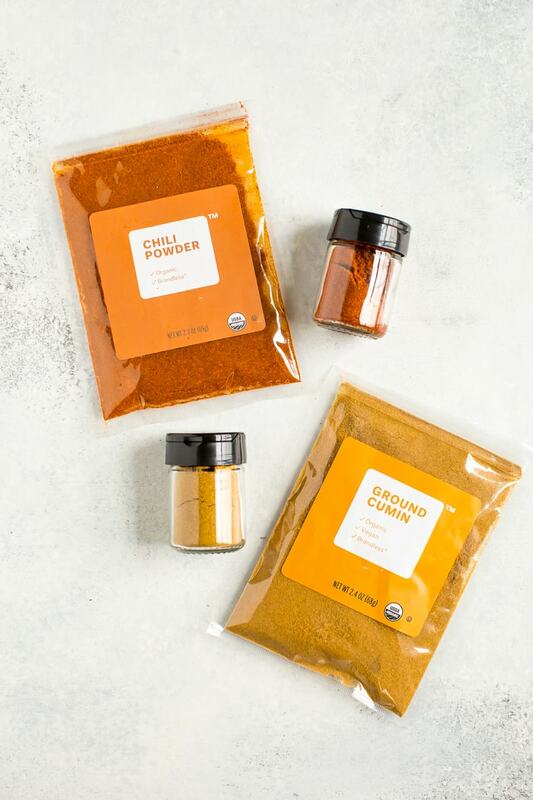 Organic spices – Spices can be so expensive so I love that Brandless offers organic dried spices for $3! My favorite thing about Brandless though? Their dedication to giving back. They donate a meal to someone in need every time someone checks out on their site. So far they’ve donated over 2.5 million meals… so cool! Back to this delicious recipe! Weeknight dinners have to check three boxes for me: fast, loaded with protein and veggies and tasty! 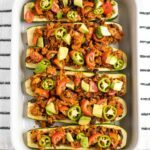 I successfully did that with these zucchini boats and Brandless made it super simple. I bought their organic chili powder, cumin and black pepper for the seasoning, their organic black beans for some added protein and texture in the salad, their organic chunky salsa and organic blue corn chips for added flavor and of course something to munch on while making dinner. 😉 The only thing I had to go to the store for were the ground turkey and fresh veggies! Where’s the cheese? 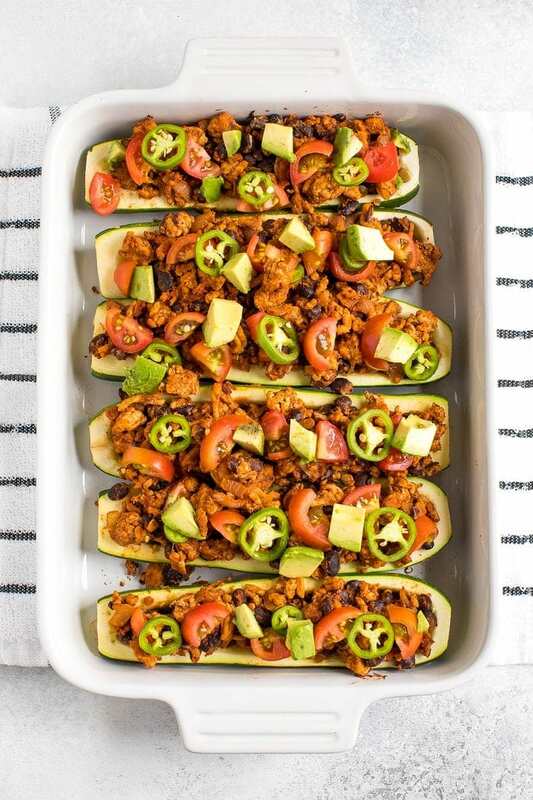 I know, I know — most zucchini boat recipes call for a ton of cheese, but I kept these boats dairy free because sometimes all that cheese is just a little too much, ya feel me? And please don’t hate me, but I’m simply not a huge cheese person. Of course, you can always add a little cheese if that’s your thing. Read the notes in the recipe for more details about that. Want to try Brandless? Use my exclusive discount code: EBF for $10 off your purchase of $50 or more! 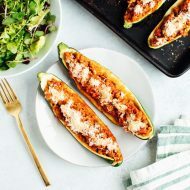 If you try these taco zucchini boats be sure to leave a comment and star rating below letting me know how they turned out. Your feedback is so helpful for the EBF community! 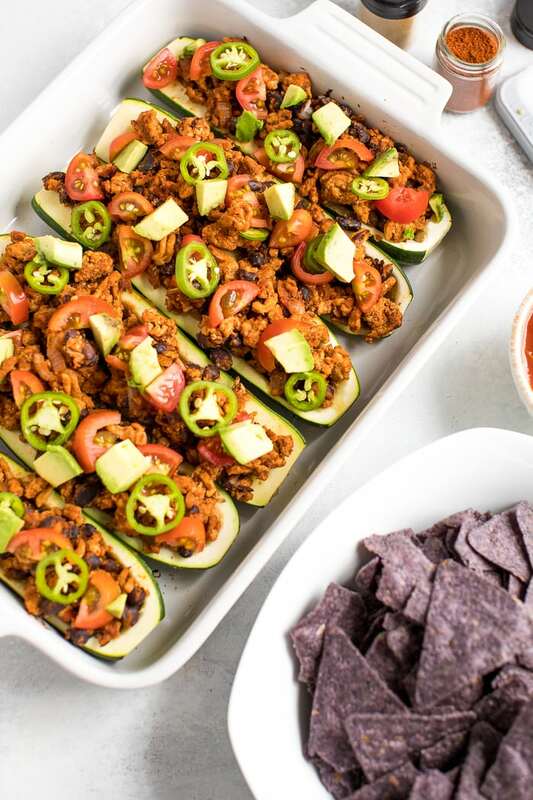 Protein packed and dairy-free, these taco zucchini boats are perfect for a quick and easy healthy weeknight dinner. Place a large nonstick skillet over medium-high heat. Add the onion, garlic and ground turkey into the skillet. Season with salt and pepper. Cook for 8 to 10 minutes, breaking apart with a wooden spoon or spatula while it cooks. Add black beans, chili powder, cumin and salsa. Cook 2-3 minutes additional minutes. Meanwhile, as the turkey cooks cut the zucchini in half, lengthwise. Use a spoon to scoop the seeds and center out of each zucchini half, leaving about ¼ inch thick zucchini boat. Place the zucchini (cut-side up) in a 9X13 baking dish. Spoon the turkey mixture into the six zucchini boats. Cover the baking dish with foil. Bake for 20-30 minutes or until zucchini boats are heated throughout and zucchini is cooked a bit, but not too soft/limp. 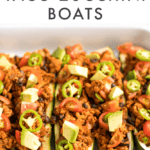 Remove foil and serve boats with tomatoes, avocado and jalapeño slices. Serve with chips and salsa, if desired. If you decide to use cheese, sprinkle a little on each zucchini boat before covering the baking dish with foil and baking as directed. Brandless sounds so rad! Heading over to check it out now! These beautiful boats look so fresh and tasty…love the cleaner approach to getting my taco fix! This is a recipe my girlfriend would love. She enjoy cutting out bread and stuff like that and replace it with veggies. I can no longer go to In-n-out without her changing my order to a burger with lettuce instead of buns. Part of me doesn’t want to show her this but I have to because even I’m curious about tasting this! I made this recipe tonight, as part of my meal prep. It is so good! It is so simple, and quick, but still very flavorful. I served the meat mixture with rice instead of the zucchini, and it reminded me of a healthier version of a Chipotle burrito bowl.